Tell the Ontario Energy Board: No to Energy East! Join Ecology Ottawa and other groups on January 22nd to have your say on the controversial Energy East pipeline. The Ontario government will be in Ottawa as part of a set of provincial consultations. 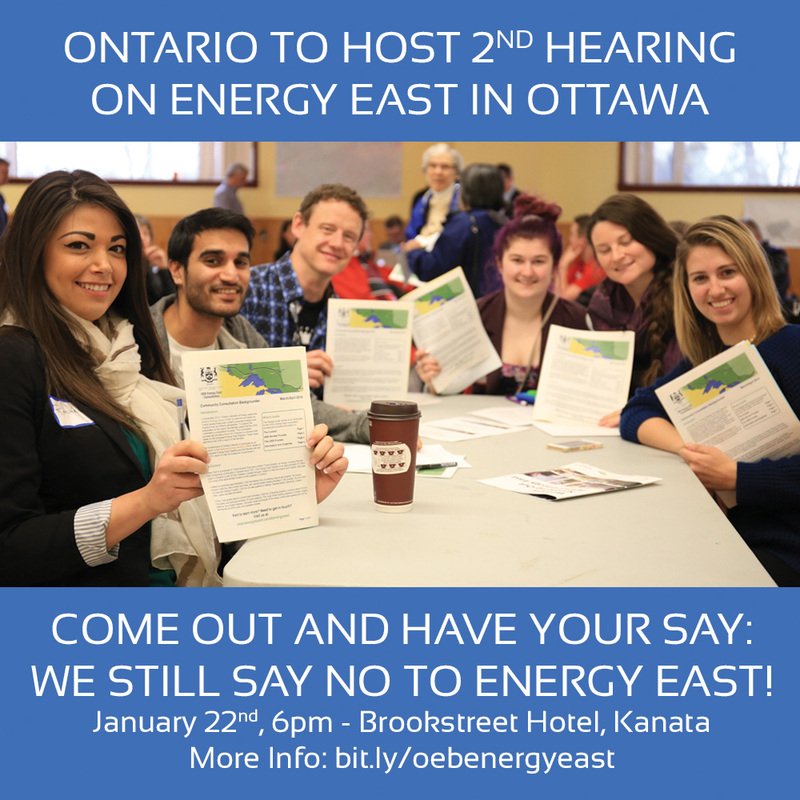 We need you to be there to ensure they hear loudly and clearly that residents of Ottawa say ‘NO’ to Energy East. We will also host an online webinar (web tutorial) on Tuesday, January 20, at 7pm to answer questions about the OEB consultation and the pipeline. Please see https://www.youtube.com/watch?v=7yWuxBaC4iI when the webinar begins. To participate in the live chat, you may need a Google account. Even if you can’t make it in person, you can still have your voice heard, by following the hearing live online or by sending in your own letter. You can find instructions on how to participate on the Ontario Energy Board website. You can also RSVP on Facebook, share on Facebook and Twitter to help get the word out! 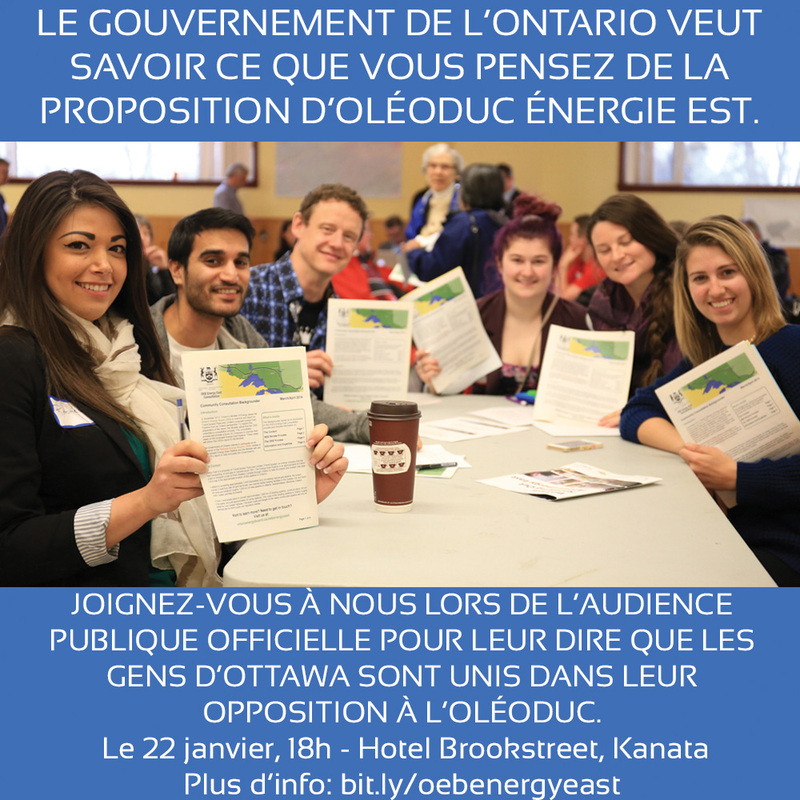 Joignez-vous à Écologie Ottawa et à d’autres groupes le 22 janvier pour vous exprimer au sujet de l’oléoduc Énergie Est, qui est très contreversé. Le gouvernement de l’Ontario sera à Ottawa dans le cadre d’une série de consultations provinciales. Nous avons besoin de votre participation pour qu’ils entendent très clairement que les gens d’Ottawa disent NON à Énergie Est. Nous présiderons aussi un Webinar en ligne le mardi, 20 janvier à 19h. Veuillez consulter https://www.youtube.com/watch?v=7yWuxBaC4iI pour le voir. Même si vous ne pouvez pasassister à ces évènements, vous avez encore l’option d’exprimer votre point de vue en participant à une audience publique en direct ou en envoyant votre propre lettre. Vous trouverez les indications sur les moyens de participer à l’audience en direct ou par écrit, en consultant le site Web de la Commission de l’Énergie de l’Ontario. Aider nous s.v.p à diffuser ces informations en les transmettant ou en les partageant sur Facebook ou Twitter. North Bay folks set the bar pretty high for us tonight! Read through this article, they had some pretty hard hitting (and necessary!) questions for the OEB last night. "North Bay resident and city councillor Chris Mayne seemed to encapsulate the crowd’s feelings when he delivered a comment to the OEB during the question period.“All we have been doing is discussing risk; to the citizens of North Bay and in this area, there is no acceptable level of risk,” Mayne said bluntly." Could someone provide a link to the stream of the event? Also will there be a recording of the event available to the public? Helo all - I have some space in my car for folks wanting to attend from centretown, glebe, ottawa south area. will be staying for the whole discussion. Message me! For your reading pleasure, we've prepared three new reports on Energy East that answer the questions: What can the City of Ottawa do? Why is Energy East bad for the climate? Why is Energy East just a bad idea generally?